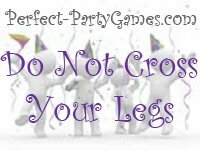 Summary: Do Not Cross Your Legs is a competition where those who do, lose. A safety pin or clothespin for each player. Give one pin to each guest as they arrive and explain the game. If a guest is seen crossing their legs, anyone can point this out and take that guests pin. If the player with crossed legs has more than one pin, the new player gets them all. The player that has collected the most pins by the end of the party, wins. Use candy necklaces instead of safety pins.